I get questions answered so often it’s lost it’s specialness. The cooldown on Answer Pidia’s Questions has been changed to 1 year (was 1 week). Mitch gave you what you deserved. Q4tQ: do/should NPCs have Fall Damage, like we do? Do they? No, not unless it’s part of a scripted event like an NPC jumping/being thrown off a cliff. Should they? I would love it if they did! I mean, I’m not sure how it would work, and it would probably give a major advantage to knockback/Mind Control classes, but hey. I’m one of those, so that’s totally okay! Being completely serious, though, I would like it if at least the NPCs in the AI Brawl could be Mind Controlled and killed by making them jump off the cliff at the Lumber Mill. That’s a staple of that BG and it’s a real shame the AI are immune. So is the level 50 cap on the Heart of Azeroth people were talking about the other week a hard cap or just when it becomes almost impossible to keep leveling it due to the azerite knowledge increase stopping? Unless things changed, the Heart of Azeroth can technically continue gaining levels. That said, any time I’ve seen someone refer to a “cap,” it’s been in reference to the max level required for top-end raid gear. As far as I’m aware, the highest HOA level you’ll need right now for any piece of gear is 48, so I’m not sure where 50 came from. Regardless, you can theoretically level your Heart of Azeroth as high as you want… it’ll just take forever. I’ll take heat over Michigan cold any day, man. I hate Michigan cold. Hate, hate, hate. LOTHARFOX DIDN’T ASK A QUESTION BUT WHO CARES?! The beginning of every month at work I have to do this long, data entry thing, and it’s boring. To pass the time, I put on Offspring to listen to. Every month I then look up “When is the next Offspring album coming out?” And every month I’m disappointed there is no date. In early 2017 they said hopefully late that year, definitely 2018. In Nov. of 2018 they said maybe two albums in 2019. It’s April, still no update since then. This is two years of obsessively looking this up every month. Damnit, Offspring. Just put out SOMETHING. Tool fans would like a word with you. Or, at the very least, a mutual crying session. Pour some out for the musical Godots out there, folks. Q4tMitch: During your wars with Mitches that hail from other dimensions, how are we meant to know that it’s our own Mitch that returns? It is well know that the losing Mitch is shattered into pieces, and devoured by the victorious Mitch to gain new knowledge and power. I think you guys discussed this pretty well in addressing the fact that you can’t ask a question only your Mitch would know, because every Mitch gains the knowledge of the Mitch it defeats. Likewise, you correctly pointed out that it could have been a different Mitch answering each and every Queue since the beginning. So the real question you have to ask yourself is, is there any real difference? Does it matter which Mitch I am? If the “real” Mitch were defeated long ago, would you even want that one answering your questions? If a person is the same person as another person, are there really two people? Ultimately, these are questions you need not concern yourself with. Q4tQ: Is the Knaifu quest line going live this week? Crucible of Storms opens up on the 16th, so this would be the last chance for the quest to be used as a lead in. Bonus question: Will you be keeping the gift? We don’t actually know the answer, but I wouldn’t be surprised to have it this week because, as you said, it makes sense as a lead-in. Then again, it’s not like it’s an attunement or anything, so I could see Blizz putting it in the game next week with the raid. I’m really hoping it’s out today, though, for obvious reason. And yes, I’m taking the gift. Of course I’m taking the gift. Vrykul are cool, but the “valorous”-looking ones really aren’t my thing. Couple that with the fact that Silgryn is wonderful, part of one of my favorite zones, and has great VO, he wins easily. I will never forget Ymiron, both in his role in Wrath and his reappearance in Legion. I like the dude more, and I’m kind of upset he’s forced to serve that jerk Odyn forever. 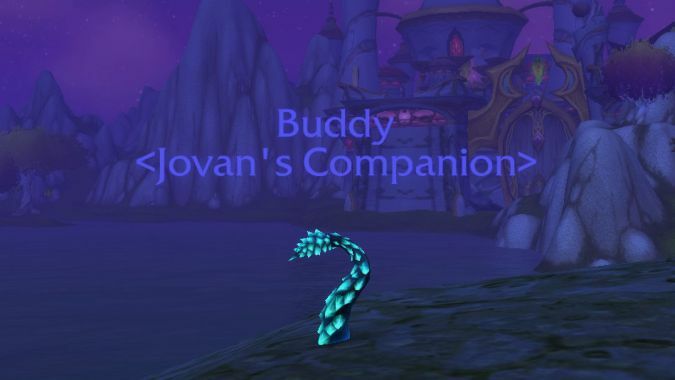 I think I prefer Podlings, but neither of these is necessarily a race I enjoy. I mean, they fit their role perfectly fine, but they kind of freak me out. Especially the weird muscle-y-ness of their bodies. That’s all for today! Apologies if there were more “silly” questions than usual this time around. Some of the questions asked weren’t ones I had any solid answers for. Feel free to repeat them today, tomorrow, or any other day if your question wasn’t answered!